Explanation: Large galaxies and faint nebula highlight this deep image of the M81 Group of galaxies. First and foremost in the above wide-angle 12-hour exposure is the grand design spiral galaxy M81, the largest galaxy visible in the image. M81 is gravitationally interacting with M82 just below it, a big galaxy with an unusual halo of filamentary red-glowing gas. 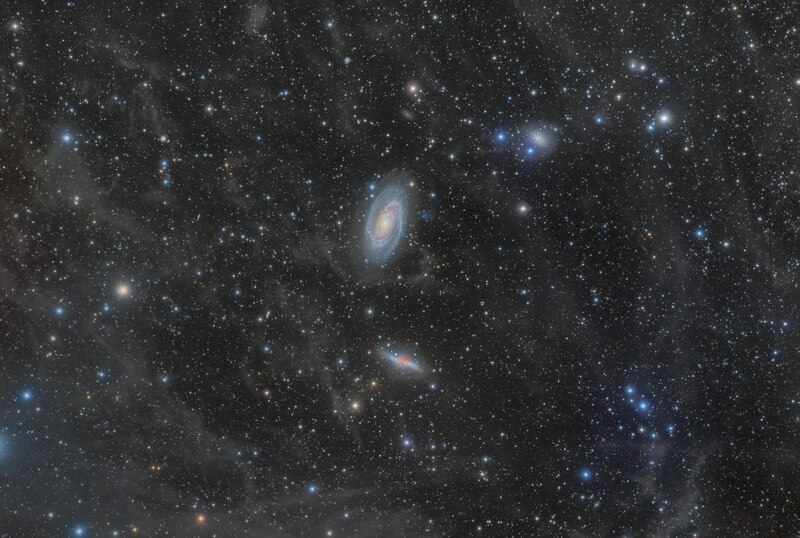 Around the image many other galaxies from the M81 Group of galaxies can be seen. Together with other galaxy congregates including our Local Group of galaxies and the Virgo Cluster of galaxies, the M81 Group is part of the expansive Virgo Supercluster of Galaxies. This whole galaxy menagerie is seen through the faint nebular glow of the Integrated Flux Nebula, a little studied complex of diffuse gas and dust clouds in our Milky Way Galaxy.